PBM Be Wiser Ducati rider Glenn Irwin. Glenn Irwin says he will do whatever he can to help his PBM Be Wiser Ducati team-mate Shane ‘Shakey’ Byrne secure his sixth MCE British Superbike title as the championship enters the final stretch. The Carrick rider claimed his maiden BSB victory in mixed conditions at Silverstone last weekend on the Panigale R in race one during the triple-header weekend. Irwin’s own hopes of making the Showdown were thwarted through injury after he crashed in practice at Knockhill in Scotland, sustaining arm and shoulder injuries. However, the Ulster rider is gradually returning to fitness and Irwin and will aim to bolster Byrne’s championship prospects by taking points off his rivals as the Showdown begins in earnest this weekend at Oulton Park. “Obviously I won't forget Silverstone in a hurry but that's now done and dusted and I intend to keep building and making progress,” he said. “We made positive steps at Silverstone outside of our victory, we made the SC1 tyre work much better in the second race and I felt content that I could have this option in the future races. Jordanstown’s Andy Reid is ruled out with a broken femur after crashing in Sunday’s opening race on the Tyco BMW. 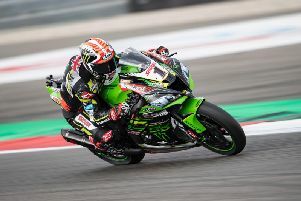 The Northern Ireland team failed to make the Showdown for the second season running, with Christian Iddon crashing in treacherous conditions in the third and final race of the weekend, which saw only seven finishers. Reigning champion Byrne is joined in the three-round Showdown by Josh Brookes (Anvil Hire TAG Yamaha), Leon Haslam (JG Speedfit Kawasaki), Peter Hickman (Smiths Racing), Jason O’Halloran (Honda Racing) and Jake Dixon (RAF Reserves Kawasaki). After Oulton Park this weekend, the penultimate Showdown round will take place at Assen in the Netherlands (September 29-October 1), with the finale at Brands Hatch from October 13-15.